Faces on the streets of New York. 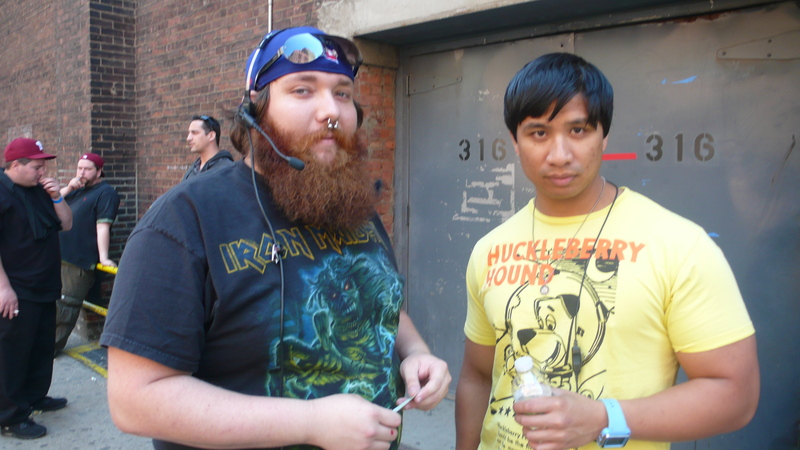 Making the scenes and working behind the scenes, beginning with road crew working at the back of the theatre where auditions for America’s Got Talent were held. 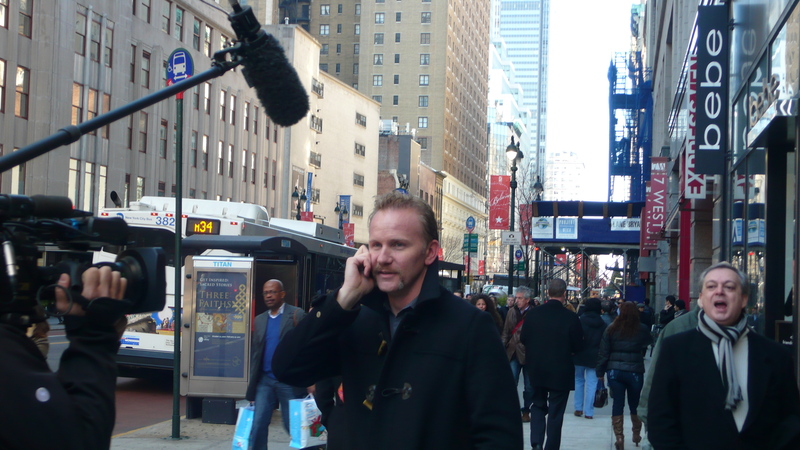 Morgan Spurlock, his next documentary? Remember, you saw it here first! A stylist adding some model touches during the shooting of a Louis Vuitton commercial. Thanks Jo! So much happens in NYC without having to go too far to find it. SIG, so much action, all the way to “Cut!” And then they start all over again! Thanks Doris! The subjects in these shots are way cooler than I will ever be! So much to see and you capture the vibrancy of the city well. Thanks for sharing it with us. What you find in this city without having to look too far! Always, Alan,thanks for the thanks! So many stories P&K, thank you so much for enjoying! I love these – people are always fascinating and you’ve caught them so expertly. I love the expression on the man’s face in the background of the second photo. What made them fascinating to me is / was that they were out on the streets, all in the course of a day’s work. We see the finished product but seeing the effort and the faces behind the scenes has me in awe of the process involved. As indeed I enjoy the richness of your words from “Becoming herself.” Thank you! Wow, I am honoured IT, thank you so much! nice one patti..I think the guy in yellow seems to have a semblance with every other guy here in the Philippines.He looks so Asian hehehe..
All I can say to this John is that the Philippines must be full of good looking young guys! All best and thanks! My pleasure and thank you Changeversations! Have you been to NY? Perhaps you might even be from NY? Photos that are real and tell a story, that is just what this challenge is about… good work. Faces and the photography of them are indeed a challenge as they are all we have, each and every one so special. Thank you so much Maggie! The best photos are from real people on their day to day way of life… Giving us a glimpse of the New Yorkers- spectacular! No wonder people are always drawn to it… real, beautiful. Have a blessed day my friend. Thank you IT. I am always fascinated by the jobs people do and here in NY we do get to see a great variety in action. You have a good day and keep smiling! Thanks Jake! It was a tough one this week, don’t you think? Cecelia, thank you so much! Can’t wait to see your latest entry! I wish I had the stylist to boss me about. Thank you so much for looking! Great photos! Very interesting faces! I wish my husband would visit his relatives still living in NYC. That way I could tag along and see the sites. Thank you Theresa. Maybe time to organise a family re-union! Good luck and I do hope you get to see and enjoy the sites one day soon. Love them, love street photography! Gilly, thank you! So glad you enjoyed! Thank you and cheers to the tree growing in Brooklyn!